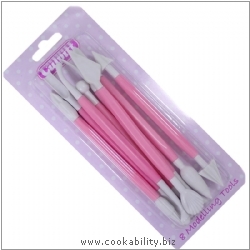 Sugarcrafting modelling tools are a must have for keen sugarcrafters and beginners. The kit includes a blade and shell toll, used for modelling and running round the edges of petals and leaves. And a veiner used for creating the veins on leaves. Along with a collection of other sugarcrafting modelling tools. 16cm appx.